Are you looking for prepaid wireless monthly plan reviews?! Do you currently, or have you used prepaid wireless Monthly plans in the past? This plan type is a hybrid that sits between classic pay-as-you-go and monthly postpaid contract plans. These classic plan types give you a bucket of minutes, text messages, and high speed data, as well as other features on a monthly basis. Historically, the Monthly plan category was the first step c loser to a postpaid wireless plan look and feel before prepaid monthly unlimited wireless plans came to the market. It represented a massive step forward for the prepaid wireless industry in terms of offering customers much better value than a high cost pay per minute classic pay as you go plan. These Monthly Plans are great for people who are willing to commit to a monthly payment for a set number of minutes and features in order to get better value than per minute or daily plans. Note that when I say "commit," I don't mean committing to a long term contract, but simply to a larger payment for a 30 day period. In other words, you can stop paying at any time without a penalty (other than losing phone service). But if you continue to pay by the month, you can get much better value than paying on a per minute (PAYGo) basis. 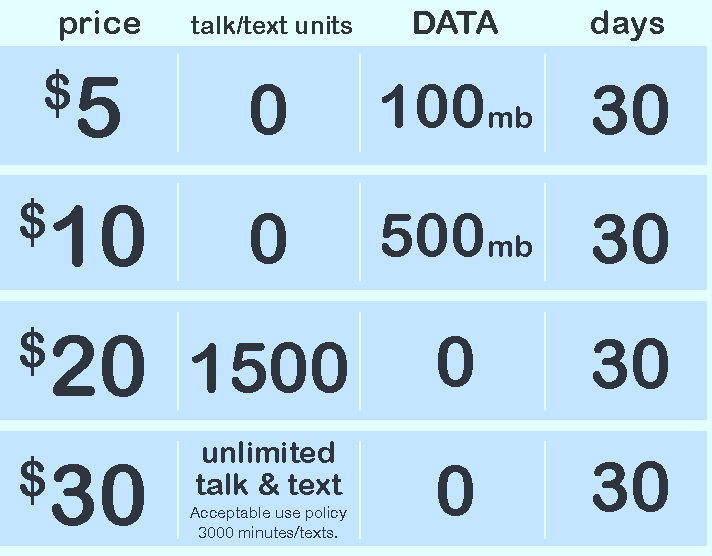 Which prepaid wireless service provider(s) have you used with this type of service? Do the included features meet your needs, or do you find yourself needing to spend more to get the services you wanted? Is monitoring your monthly balance and payment date difficult, leading you to frequently miss your monthly payment due date? Would you recommend a monthly service to a friend or family member considering this type of prepaid wireless plan? Do you have to pay taxes and/or reload fees when adding money to your account (i.e. For paying your bill)? Note that it's not necessary for you to specifically answer these specific questions. They're just here as suggestions to help get you started thinking about what you want to write to help visitors fully understand your experience, so please openly share your thoughts. We want to know about your personal experience so people can figure out what's the best Monthly plan out there, or whether or not they like this plan type at all! What's the Best Monthly Plan? Do you have experience with Monthly Plans? Please share it! Click on the links below to see some great reviews about Monthly Plans. They were all written by other visitors to this page.